Our Water-to-Water unit uses renewable energy to produce clean water from seawater, brackish water, or contaminated water sources. The world has plenty of seawater and polluted water. Up to now, the challenge has been to convert that water into drinking water at the point where it’s needed and at a scale that’s appropriate and affordable. The Water-to-Water units have solved those problems. 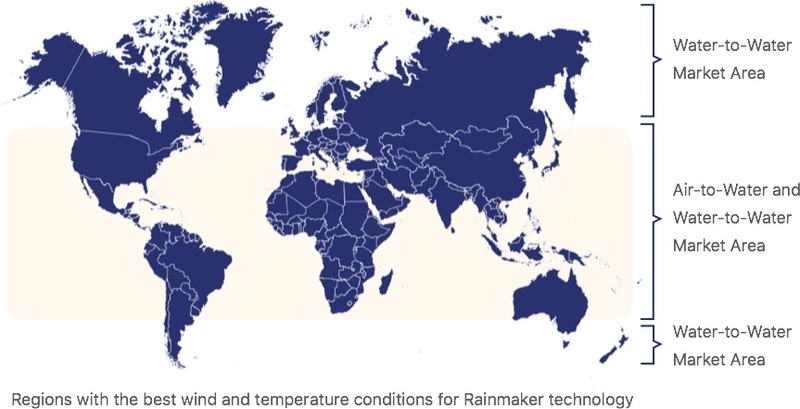 Customers for Rainmaker’s Water-to-Water technology include governments and communities, NGOs, military, and commercial or industrial companies. How Rainmaker’s Water-to-Water technology works. Using a Membrane Distillation process, water is evaporated under low pressure by a heat pump condensation process that recycles the heat through an evaporator. The vapour produced from heating the water passes through the vapour-selective and hydrophobic membranes. This membrane only allows water vapour to diffuse through, unlike Reverse Osmosis where water containing dissolved salts and other solids pass through the membrane. result. The driving force of this technology is the partial pressure difference (temperature difference) between each side of the membrane pores. They can be efficiently powered by wind, solar, grid, generator, or combinations. Water can now be produced at the point of use, eliminating transportation and distribution costs. Water-to-Water units are available in three sizes, producing 37,500, 75,000 or 150,000 liters of drinking water per day. Rainmaker Water-to-Water units offer you the most flexibility for power options, depending on preferences and infrastructure. Wind, solar, or generator-powered units require no other electrical infrastructure. Requirements for Rainmaker’s Water-to-Water production. Benefits of Rainmaker Water-to-Water production. Air-to-Water: Clean water from humidity in the atmosphere. Using innovation in heating and cooling, our Air-to-Water unit produces clean water from the air. This product can be driven efficiently by wind, solar, grid, generator or combinations thereof. Water is produced at the point of use eliminating transportation and distribution cost.